I got to spend Saturday afternoon with my new friend Korin (owner of Sweet & Sassy Stamps) and she let me play with some of her stamps (fun!). 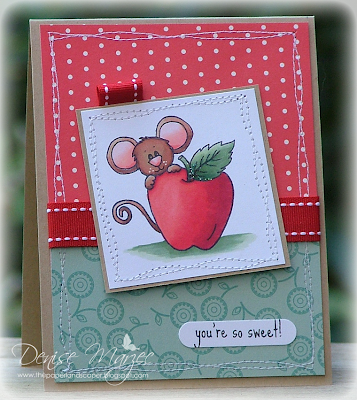 Here's my very first Cocoa card...isn't that little mouse's face just the sweetest?! Love it! The main image is up on foam tape and I added a little bit of Stickles to the stem and leaf on the apple. I just love Cocoa! I have one set of Korin's stamps, but I saw them at L&L and they're really CUTE! Awesome coloring on this sweet card! Great stitching! Denise, this is just darling!!! Denise, this is so, so cute! Love your coloring, colors and layout. Darling card. This little guy is cute cute cute! I love your card Denise!!!!! eek! Isn't she sweet?! Love how beautifully coloured she is! Your whimsical stitching is so fun too! Catch up with you in a few more days!!! Its great Denise, love it, love it. Too cute Denise! Love your stitching and your coloring! A sweet image Denise, colored beautifully! Love the sewing on the panels! Such an adorable card, Denise! I love the irregular stitching lines you made...it's a great detail! He is adorable and fabulously coloured. Love the mix of DPs and ribbon tab you used. Great card. He's adorable! Fab coloring, girlie! Very SWEET card Denise. He's adorable. oh, he's adorable Denise. How fun it must have been stamping with Korin - I would love to stamp with you guys one day. What a sweet image. Gorgeous coloring and awesome stitching GF!! Awww! TOO cute! This is adorable, Denise and your coloring is fab! Love those cute papers and stitching, too! Super cute, Denise...you have colored that adorable image beautifully and I love how you sewed around the image!!!! Oh, the mouse is so adorable - who could resist his dear sweet little face :-) Cool stitching too - and love that little bit of ribbon at the top of the image - what a great idea! So gorgeous card Denise,I love the image and your papers. Cute! 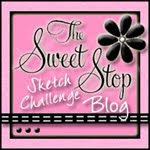 Stampin' with friends is the best! Love this little peekin' mouse! Ack, this is too cute! I am so glad were were able to spend some time together and I am looking forward to next Saturday :)!